What is Partnership Registration ? 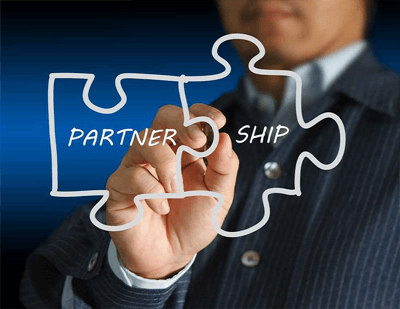 A Partnership is a business structure in which two or more individuals manage and operate a business in accordance with the terms and goals set out in the PartnershipDeed. Partnership registration is relatively easy and is prevalent among small and medium sized businesses in the unorganized sectors. Partnership Registration is done through Balaji IP Practice. For Partnership Registration, you must agree on a firm name and then establish a partnership deed. It is a document stating respective rights and obligations of the partners and to be valid it should be written and not oral. The terms of the Partnership Deed can be varied to suit the interests of the partners and can even be made contrary to the Indian Partnership Act, 1932 but if the Partnership Deed is silent on any point, then the provisions of the Act would apply. You are required to fill the details in our simple online questionnaire and submit documents. Further after submitting your documents we shall draft your Partnership deed. The Statement must be signed by all the partners of the firm and must also be verified by affidavit in the prescribed manner. All the above mentioned documents must besubmitted to the Registrar of firms of the state. A certificate of Registration is then issued, by the Registrar, and a copy should be given to all the partners. Also, a separate registration with the Income Tax department is to be done in order to avoid any future problems and must obtain a PAN card and a bank accountunder the name of Partnership firm. Partnership in the Corporate world refers to a relationship when two or more people decide to share the profits of a business carried on by them all or any of them acting for all.It’s generally done in legal terms. The percentage of ownership varies and depends on certain factors. Partnership firm thus is a firm which allows joint ownership of a business. There are certain rules and regulations that have to be followed while setting up a Partnership firm. Registering a partnership firm is not compulsory under the Indian Partnership Act, 1932 but only Maharashtra has made their registration compulsory. Further a partnership firm can be registered at any point of time i.e. even several years after formation. Registering or not registering a partnership firm has itsown advantages, but like a coin which has two faces, it definitely has its own disadvantages too. Described below in detail is how a partnership firm works and how can you register for partnership firm in India. The partnership is relatively easy to start however, there are certain conditions and restrictions to be followed in setting them up. Also, according to Indian Partnership Act,1932, consent of all the partners in a partnership firm is required in fundamental matters (like admission of new partners, dissolution of the firm, conversion of the firm etc.) and a majority in other matters and there should be sharing of all the profits or losses made in the business. It also states that there has to be a legal contract that There are certainly more rules while setting up a Partnership firm, clearly stated in the Indian Partnership act,1932 and they should be followed strictly to avoid any severe actions made by authorities towards your firm. Partner Cannot sue firm: A partner in an unregistered partnership firm cannot sue the firm for enforcing any rights under the Indian Partnership Act, 1932. Cannot claim Setoff in a dispute with a third party. The firm cannot sue third parties whereas the third parties would be able to sue the firm irrespective of registration. At least two partners are required for LLP registration. The maximum partners can be 200. If you are the sole owner, you can register as a One Person Company. Any individual/organisation can become the partner in LLP including foreigners/NRI’s. However, the individual must 18+ above in terms of age and should have a valid PAN card. 3. Do I have to be available in person to incorporate an LLP? Our procedure is 100% online which means there is no compulsion for you to be present at our office physically. A scanned copy of documents can be sent to us via mail, and we will handle the rest. You will get the company incorporation certificate from MCA via courier at your business address. 4. Once I pay for the incorporation, is there any other payment before I get the Incorporation Certificate? We do not have any hidden charges. Our system is quite transparent. After making your payment, we will send you an invoice that is all-inclusive, with no hidden charges. Our team provides you support till you get your LLP bank account. 5. How much money do I need to invest upfront in starting the business? You need to have a bank account with a minimum balance, which could be as little as Rs. 5000. You need not invest any more capital in starting the business. You needn’t even deposit this amount to the bank. You can also show that the capital has been utilised as the pre-incorporation expenses of LLP e.g, LLP registration expenses. You can also show this capital has been infused in form of assets such as computers etc. 7. Can I register the LLP at my home address? Yes, you can register your LLP at your residential address. It is perfectly legal to start the company at your home or in your garage. MCA team typically doesn’t visit your office. You just have to provide your home address proof such as rent agreement or electricity bill. 8. Can a Salaried working person also become a partner in an LLP? Yes, you as a salaried person can become a partner in an LLP. You need to check your employment agreement if that allows for such provisions. In most, cases employers are comfortable with the fact that their employee is a director in another company. 9. Can I convert my Limited Liability Partnership (LLP) in a Private Limited company? 10. In which cities does LegalRaasta provide LLP formation services? LegalRaasta provides LLP incorporation services across India in all cities. We have done LLP registration in Mumbai, Delhi, Gurgaon, Noida, Bangalore, Chennai, Hyderabad, Ahmedabad, Kolkata, Surat, Pune, Jaipur, Lucknow, Kanpur, Nagpur and other Indian cities.